the provinces of Rift Auspikitan and Solea are interested in joining the BSB independently of SKA, if Darvwnse-a is not interested. onward for progress and unity! and y coords are taken into account there. also, the goal is to have portal 1 stay where it is. I'll try the y level thing though! Thanks. so i'm trying to make a portal to reach horse roads, and a portal for general walking level... the latter already exists, and i'm having problems making the former. i literally can't get to any portals i make at horse road levels from the overworld... it just goes to "1"'s nether portal... and if i destroy that and move it like... 15 blocks south, it goes to portal "a"
portal "a" links to the blaze farm when going back to nether and leaving through it again goes to darvincia "b". i have made several portals at horse road level, currently only one is active (at -73, 100) which should correspond exactly to "4". optimally, i would like to have a portal nearish to -73, 105, 100 that goes to "2" but that's obviously too close to the "1" portal pair. i unreasonably moved the overworld portal to "4" which is much too far to really make sense for linking to the horse roads from Auspikitan. Meh, I don't really want that northern part. 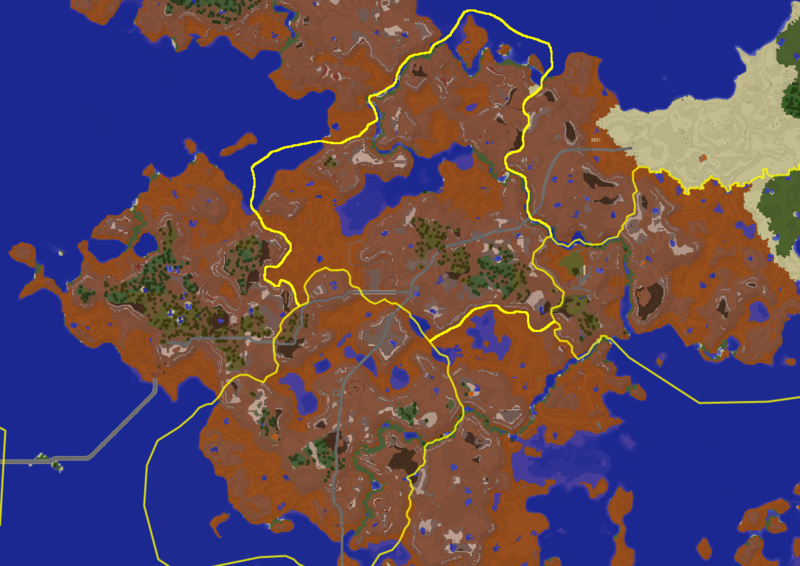 I'd be fine with only the thick orange line being the border, if Bla is fine with me cutting through the taiga and not following terrain, but if not, there's the thin orange line. What do you want to happen to Fykisel? I'm probably going to get rid of Fykisel and claim some region near Alteus in the next few days. I do not approve because it is nowhere near civilization. You're looking too much into it. It worked well on my server. taŋkwki kel ŋavešil selka akute kei gevsaky sel Smørrebrød avi ok ɰettwšil akka fikka!! !